Matthew R. Burkett is an associate with Fay Sharpe LLP. Mr. Burkett has experience in various intellectual property matters, including patent preparation and prosecution in the mechanical, automotive, manufacturing, industrial, material science, chemical, software and business method areas, and trademark preparation and prosecution. Mr. Burkett also has experience in conducting opinion work regarding the validity and infringement of patents, in addition to performing freedom-to-operate and patentability opinions covering a diverse array of technological fields. Prior to joining Fay Sharpe LLP Mr. Burkett completed his undergraduate studies at Ohio Northern University, where he obtained his Bachelors of Science in Mechanical Engineering. He then matriculated in the University of Akron School of Law’s J.D. / LL.M joint degree program with a focus on intellectual property. 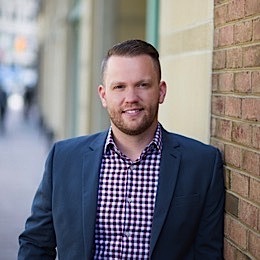 Mr. Burkett joined Fay Sharpe LLP in 2012 as a law clerk, a position which he maintained throughout law school until becoming an associate in 2014.